Tanking is what here in the forum we ‘re saying, when a team is staying on purpose in the same League level. Loosing many games and finish the season in position 10th or lower. The 9th position normally doesn’t promote to next level but many times this can happen so we must be careful at that. Why many teams are tanking ? The most common reason is that we want to have a stronger team and be more competitive . Of course there are also other reasons. - To avoid some strong opponents we ‘re playing together for some seasons. - Because we don’t have time to play and be active for a period (maybe it’s a second team we have) or because we just want to make a break. Unfortunately we don’t have any save/load option, to continue after some time. For example we are pissed of from the game or our season so far. Some use tanking for their association teams. To keep a high q or a low q team, playing only in asso tournaments. If you want to share your experience, feel free. Ok, tanking isn't the best option for the game but there are some missing options. 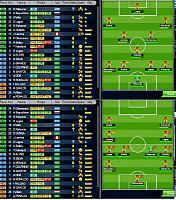 or to use another secondary team (like the International Cup team) only for asso games. Last edited by nikolgiorgos; 07-22-2018 at 09:37 AM. Alfredo Ganer, Niddhoeggr, Ποσιδονας and 2 others like this. If we won’t promote, our players won’t loose a star and if we also increase their quality in tanking season, we can have a very strong team for the next season. 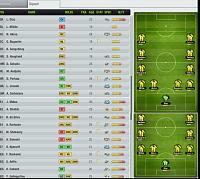 Also during that season, we can give our young fast trainers, extra positions or special abilities (sa). If we won’t spend sources for power training, we can save a good pack of greens (and reds as we don’t care much for injuries). This season we can save also a good amount of tokens too. Because we keep many of the players we had, we don’t care to enforce the team from the first days of the season (bidding wars days) and remember that the last 2-3 days of the season, we can find some interesting players that some managers are selling before the new season (to drop quality). Players with multiple positions or a very good discount in Value without bidding wars. We loose one season from the career of our team. This successful line of trophies, good positions and achievements, interrupts for one season. Our stats also getting worst. The lost games increasing, as the overall Goals against . Our players getting one year older, without to offer to the team. A young fast trainer increasing his q but loses one “productive” year. In the mid-lower levels, those players loose their Value (because of the age) , even if they keep their stars. Finance aren’t good for the team. We loose the prize money from the League, probably not promoting to next CH.L. or S..L. and maybe we have to lower the tickets to keep the same fans attendance. One positive is that we set the win bonus to zero (at least in the league). Generally a second tanking season isn’t so good idea. Or have a good stock of greens to increase more the q if necessary. If you have normal opponents, you ‘ll be the king ! My suggestion is that league draws of the latest seasons are weird so maybe it’s pointless trying to manipulate it. Do your best and pray for some luck. Maybe you ‘ll find other strong teams-tankers but with the purpose to stay again in same lv. Champions league : You won’t participate in the next CH.L. or S.L. unless you ‘ll win the CH.L. or S.L. trophy of this tanking season. In that case, you (probably) gonna play in a same level CH.L. next season. Cup : There we have the chance to put our normal team. The draw probably not gonna favor us as we may have a high q and play with +1 lv teams but we can try. The same here, the season after tanking, if we want to have in a logic q draw, it’s better to keep 8/9 high q players and 5/6 low q. The most safe formation to loose the game is the “Wall”. Another secure move is to set another player (better MC- attacker and not defender) in GK position. You must set your GK as penalty, F-K, C-K 1st choice. 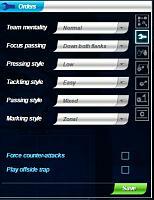 No arrows, everything normal except easy tackling and passing from the middle. Its useful to have some “bad” players in your roster for doing tanking. A good choice is to keep from previous seasons those 0T academy players of 1*-2*. To those players we must give an extra position or sa, so not to increase their quality. If previous season we had some players with the (?) contract, don’t sign them. If we don’t have 14 players with contract the first day of the season, the game will give us some 2*-3* veteran players – who are very useful for using them in games we want to loose. Now, we have the choice to use some normal players so to improve their q but they will have bad stats and rates as we are loosing the games. If we intend to keep those players for the future, it doesn’t mind as we know the reason their stats are bad. But if we want to sell those players, better not use them in “lost” games as another who is interesting to buy, also checking the stats of the player and bad stats can prevent him for bidding or increasing his offer. In a tanking season, it’s useful to have a group of 7-8 players who are young fast trainers and gain 1 or 2 stars during the season. As we loosing one season, when w ‘re searching for young players, go for 18 y.o. players and better avoid the ages of 20 -21. Cloverfield, achiie and Niddhoeggr like this. If there is another tanking/abandoned/very weak team in your League and you ‘re playing with him, better use the normal team and try to win with a 5-0 or above. You ‘ll get the double morale booster, improving the stats of your good players and the team general. Using an ub-normal formations vs another one, maybe win the 3 points but loose the above. It’s not easy to gather moral packs in a tanking season but there is no reason to use them too. Use them only for some young fast trainers, when their morale drops to very poor (because they will be vulnerable to injuries and loose some useful training days). The same with the red packs. Only for the young fast trainers. 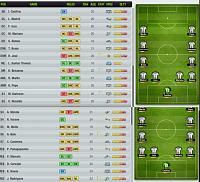 If you are playing vs a strong team, you can use a normal formation but with weak players, or use 3-4 good players too. Using illegal formation and players out of position, can cause injuries and cards. It’s good not to “affect” the league with your tanking team. For example don’t use your main team vs a team which is going for the league and take away from him some valuable points. I know it’s a challenge to play and the win the League winner but it’s more appropriate to do that only if he has secured his league. The same with the teams which are struggling for a CH.L. position. If the other is ok, then you can challenge him for a good game. In theory if some manager has spot a tanking team that playing against him with his full team but vs other competitors with tanking formations, the manager can report him. Don't know how quick is the reaction of support in that case but it should be. The punishment I believe should be that the tanking manager should loose the control of his team for the rest of the season (or some period of 2 weeks). Last edited by nikolgiorgos; 07-22-2018 at 09:33 AM. Tanking is a great option for the game but it's like a knife. You can use it to cut the bread or you can kill someone with it. It can be used for abusing for example associations but it can be used as an option for many people who are unable to but or to farm greens/tokens as they can build competitive teams from time to time. Also works as relief valve. Without it many managers would leave the game. ( https://forum.topeleven.com/associat...ber-loans.html ), the problem wasn't the loan players but that there wasn't any limit. The problem was fixed with a simple way. So it's the limits or some other rules that make the different and a just system without have to abolish some nice features (as many naive people suggested there). It would be fair if you don't sit in top level of your server (not your fault if you are not promoting this way) you get -5% percent penalty! Not that much and a little bit motivating isn't it? 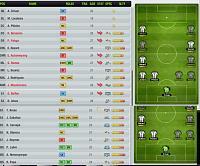 Now we 'll see as I spotted at #3, which is the official formation with the worst possible result by nordeus. the leading group of CRAIOVA (later ROMANIA) was punished by nordeus as they tried to sell their group. One of them was in the league of a friend.